There are a number of kitchen island design ideas to choose from when remodeling your kitchen. Certain island designs remain more functional than others. For instance, by adding cabinets to your kitchen island you increase how much use it gets while increasing the value of your kitchen. Your kitchen island can serve countless functions when properly designed. For instance, while all kitchen islands offer additional space to prep food and store appliances and utensils, your island could also serve as bar seating or house a second sink. 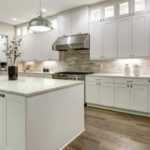 Before you get carried away planning all of the things you want to add to your kitchen island, it’s best to first make sure an island fits in your space. The island you install must comfortably fit inside of your kitchen. Kitchens with islands should measure at least 12 feet long and 8 feet deep. Islands should measure no less than 4-feet long and 2-feet deep. Measure out these figures in the space you plan to install the island and then make sure there’s still adequate room for people to move around the island and get work done. Bigger isn’t always better when it comes to kitchen islands. Keep in mind, it’s more important that you have plenty of room to walk around, open cabinets and leave the dishwasher door, fridge or any other adjacent appliances in the open position. Your island does not have to be a rectangle. You can get creative and let your style rule supreme. Ovals, imperfect squares and circular shaped islands all make for a really cool effect. Just make sure that the shape you pick is functional and matches with the overall style of your kitchen. How many cabinets will your kitchen island have? How big will cabinets be? Will you include roll out drawers for added convenience? Most islands have large bottom cabinets with a number of pullout drawers located along the top. This grants you a great place to store pots, pans, silverware and virtually anything else. Plus, since the island is frequently used to prep food, it makes it very easy to grab what you need as you go. If your kitchen and island are large enough, glass cabinets that showcase stylish shelves and fine china might make for a nice touch. 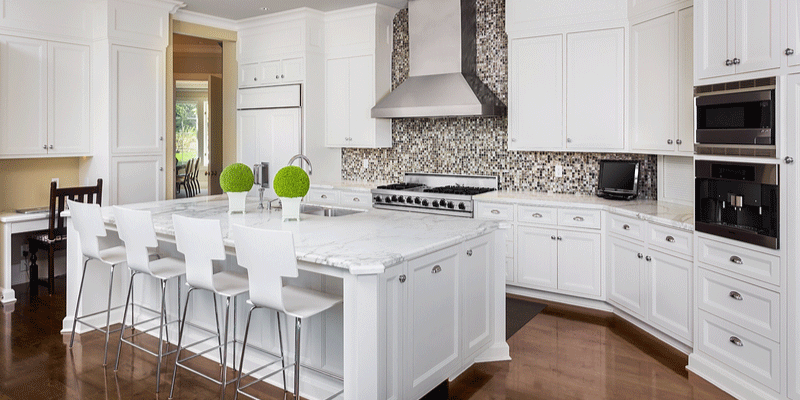 Open-faced cabinets are yet another option, which may offer added affordability. If your island has the space, it’s always advisable to add bar seating to one end of the island. Additional seating in the kitchen is a win-win. It gives people a place to sit and interact with the cook, and provides a causal place to sit when the dinning room feels too formal. It’s pretty popular to add sinks, dishwashers or cooktops to kitchen islands. All of these things will require additional gas lines and/or plumbing, which aren’t going to come cheap. 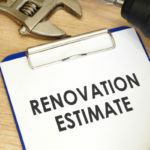 Make sure that the rest of your kitchen is in budget before splurging on these sorts of add-ons. 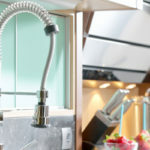 If you’re considering adding an extra sink to your kitchen, the island is one of the best places to do so. Since you are prepping food here anyway, it makes it very convenient to wash off fresh produce as you go. It’s becoming increasingly popular to add cooktop ranges with vent hoods to islands. If you decide to go this route, just make sure that there is at least 18 inches of space on either side of the cooktop or range. Some people prefer to install the dishwasher in their island. If your kitchen lacks space, or if you have a sink installed in your island, this could make a great option for you. Keep in mind, when you add any appliances such as a dishwasher or sink to your island you miss out on valuable storage space. Lighting is an important part of any kitchen and your kitchen island can benefit from additional lighting. Fixtures are often hung above islands, creating a nice focal point at the center of your kitchen. Lighting can also be mounted on the underside of island countertops to make it easier to look through cabinets. Don’t forget to add outlets to your kitchen island so that you have a place to plug in all of your fun kitchen gadgets and accessories. Granite countertops make your island stand out, while adding durability that’ll last for many years. You can score granite at affordable prices by buying wholesale from Tops Kitchen Cabinet. 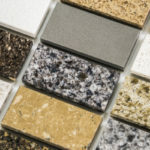 Shop our vast selection of granite colors and styles!